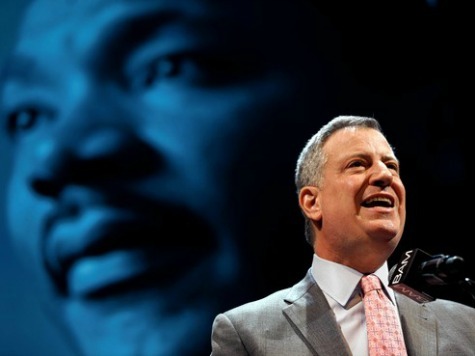 Despite the fact that a New York City Department of Health and Mental Hygiene report found that more black babies were killed by abortion in the city than were born there in 2012, Mayor Bill de Blasio has pledged to partner with Planned Parenthood and other abortion providers to expand their businesses and to wipe out pro-life crisis pregnancy centers. As reported by CNS News, the “Summary of Vital Statistics 2012 The City of New York, Pregnancy Outcomes,” prepared by the city’s Department of Health and Mental Hygiene, states that 31,328 African American babies were killed by abortion in 2012 in New York City, while only 24,758 black babies were born, leaving 6,570 more abortions than births in that year. The number of black babies aborted comprise 42.4 percent of the total number of abortions in the city, which numbered 73,815. Table 1 of the report provides “total number of live births, spontaneous terminations (miscarriages), and induced terminations (abortions) for women” between the ages of 15 and 49 and of various races and boroughs of residence in New York City. In November following the election of New York City Mayor Bill de Blasio, Breitbart News reported that de Blasio pledged to partner with Planned Parenthood and other abortion providers to expand their businesses even further by providing them with “city-sponsored” space to set up shop. Furthermore, de Blasio has pledged to use Obamacare to expand state-funded abortion coverage to more New York City women.